When Providence College eliminated their sport and gave up on them, the members of the 1999 Friars baseball team refused give up on their season. Or each other. In October 1998, as fall practice was getting underway for the Providence College baseball team, the players and coaches learned that their sport was going to be eliminated after the 1999 season. Knowing that this was going to be the last year that baseball would be played at PC, the team decided to put their emotions and anger aside and make it a season to remember by becoming champions. 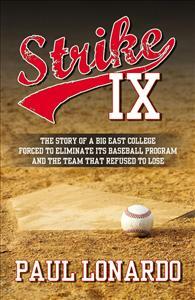 STRIKE IX is the story of this historic year and the players who decided to make their statement on the field and show the school administration that they made a mistake.